Wasps are the only winged mutated insect that fly around in forests and attack with their stinger. 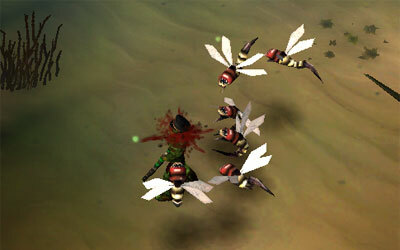 A sting from the wasp, in addition to its damage, is poisonous and would slow the player. Wasps typically come in groups and would surround the player. Since the stings are poisonous, a person may not be able run quickly enough to escape from a spot where wasps combine with melee mutants, lurkers, artillery mutants or drill-mechs, making the situation critical. Otherwise, wasps alone can be easily taken out as they have low health. A wasp may drop silver only. In coop multiplayer, a wasp has a base score of 5 and the wasp champion has a score of 40. In Chapter 2, there is a mutant champion in the form of a wasp where the game says, "A large Wasp dwells here. Fire should be the perfect way to kill it." There are lots of barrels in the environment for the player to shoot. Clearly, these wasps are especially vulnerable to fire. Since they tend to surround the player, a flamer or at least any close-ranged weapons with the fire coating add-on are good enough to deal with them given their low health. If you would like to run and gun in coop multiplayer, try to take out the wasps first because the poisonous stings slow your movement and make you vulnerable to other mutants. Good tactic is to use the Shockwave when surrounded by wasps.